A festival that started off slow but gained in momentum and drama drew to a satisfying conclusion tonight with “The Tree of Life”, US director Terrence Malick’s stunning meditation on memory and childhood, winning the Palme d’Or. At least it was satisfying for me. A significant portion of the press watching the ceremony unfold on a big screen in one of the festival theatres booed in disgust -- much as they did at the end of the movie’s screening last week. But don’t great artists always have their detractors? 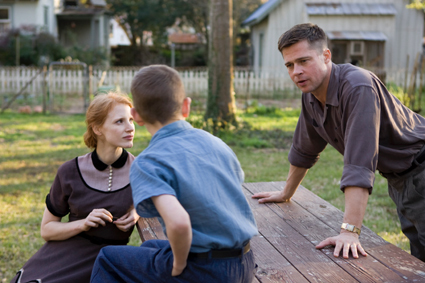 For many of us here, it was an inevitable choice, as “The Tree of Life” (only Malick’s fifth film) all but dwarfed the rest of the competition in terms of scope, ambition, and sheer emotional impact. Suspense was maintained until the end; the absence at the ceremony of the notoriously camera-shy Malick, as well as the film's stars Brad Pitt, Jessica Chastain, and Sean Penn, led many to speculate that "The Tree of Life" would, in fact, leave Cannes empty-handed. The second place Grand Prize was a tie between the Dardenne brothers’ solid, if not particularly inspired slice of Belgian realism, “The Kid with a Bike”, and Turkish filmmaker Nuri Bilge Ceylan’s starkly beautiful existential crime procedural “Once Upon a Time in Anatolia”. The Dardennes were a safe choice; it’s a movie most everyone recognises as well crafted, though I think the brothers’ films have long started to feel slightly pre-processed in their construction and moral vision. But rewarding the Turkish film was a bold, brave move on the jury's part – something Ceylan himself seemed to acknowledge with his acceptance speech, in which he noted he was surprised the jury had liked such a “long, difficult film”. The movie, which clocks in at a very leisurely 2 hours and 37 minutes, indeed sent droves of impatient, worn-out critics clamoring for the exit at its screening Friday night. Many of us who stayed until the end were awed by the film’s hushed, slow-burning power, gradual revelations, and its portrait of wounded men working a grisly job. The third place Jury Prize went to another, albeit very different police procedural, French director Maiwenn’s energetic, but wildly uneven ensemble drama “Polisse”. The film’s semi-hysterical tonal shifts, from comedy to melodrama and back again, were generally praised by the French press and loathed by American critics -- although I think we all agreed that the prominent role Maiwenn (pictured left) wrote for herself in the film was an utterly useless distraction and an indication that the 35-year-old filmmaker has some growing up to do. If Lars Von Trier left the festival under a cloud of shame following his shockingly misguided wisecracks about Hitler and Jews at a press conference, his Danish compatriot Nicolas Winding Refn scored the Best Director prize for his lean, mean LA noir pastiche “Drive”. The choice elicited some of the most enthusiastic cheers among journalists, many of whom loved the movie’s hyper-stylised violence and genre references. I liked the 80s atmosphere – complete with a great, cheesy synthesizer score – and admired the visual flair, but found the film mainly vacant where it could have been soulfully stoic. This was one of the jury’s poorer choices in my book. One of its better choices, on the other hand, was Kirsten Dunst (above) for Best Actress in Von Trier’s aesthetically gorgeous, but rather dull end-of-the-world drama “Melancholia”. If the film stays with you longer than you expect, it’s largely thanks to Dunst’s deeply affecting, perfectly modulated turn as an unstable young bride. Unlike her director, she’s able to connect emotionally -- and hold on to her dignity in the process (no easy task with Von Trier at the helm; case in point, Charlotte Gainsbourg in “Antichrist”). The American actress did not talk to the press after the ceremony, but she alluded to the controversy surrounding her director when she arrived at the podium to accept the award, sighing “What a week it’s been!” and later thanking the festival for keeping the film in competition despite Von Trier's remarks. She also thanked Von Trier – a move that drew cheers from journalists who thought the filmmaker’s banishment from Cannes was unjust. Meanwhile, popular French actor Jean Dujardin took home Best Actor for his role as a fading silent movie star in the unlikely (aka silent and black-and-white) crowd-pleaser “The Artist”. A visibly overjoyed Dujardin took to the stage and immediately broke out a few of the dance steps he performs in the film. He also dramatically bowed down before jury president Robert De Niro, who later noted in the press conference that he ideally would have liked to reward the film even more. Those of us who thought it was charming and technically ambitious, but finally rather slight were relieved he didn’t. The jury gave the terrific, dark Israeli comedy “Footnote” -- which divided critics as much as the films by Malick, Von Trier, and Ceylan – the Best Screenplay prize (to writer-director Joseph Cedar). The choice drew loud cheers from the movie’s supporters in the press, and grumbles and moans from its many haters. Heavyweights Pedro Almodovar, Aki Kaurismaki, and Nanni Moretti were shut out of the prizes, though at the press conference following the ceremony, jury member Jude Law said the jury would have loved to give prizes to Kaurismaki, Moretti, and Alain Cavalier (“Pater”). We'll be heading back to Paris tomorrow. I’ll miss the constant movie-going and debates. 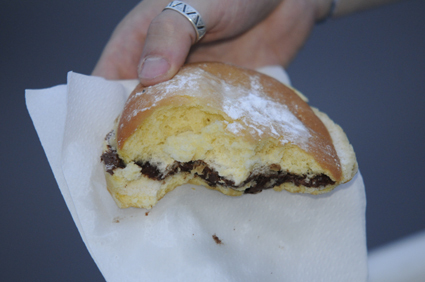 And, of course, those huge, highly addictive nutella-filled donuts sold at the stands all over the festival. One last one for the road! As a professional online wholesale NFL Jerseys, we supply high-quality of buy nfl jerseys online with low price. Providing customer with the best products and the best customer service has always been our goal. We supply 2012 cheap Nike NFL Jerseys, and fast shipping to your home. Buy your favorite cheap minnesota twins jerseys from us are all in large stock, so we can dispatch all orders within 2-4 days. The great adventure affection Cleveland Browns jerseys redness acclaimed Bernstein a white and orange stripe down the sleeve and white numbers emblazoned on the back [url=http://www.myjerseyssale.com/wholesale-nfl-jerseys]buy nfl jerseys online[/url] . Membership Kit took it all in white with orange stripes and numbers, Bernstein. To beat the pants are usually white, yellow with an orange stripe, while the [url=http://www.cheapmlbjerseysforsale.com/wholesale-minnesota-twins-jersey-22.html]cheap minnesota twins jerseys[/url] or white depending on power top, getting used to being able to be. A good business cheap nfl jerseys have a good customer service. cheap ray ban wayfarer is almost certainly regarded intended for semiconductors in addition to support systems, definitely not stilettos in addition to socialites. ray ban wayfarer sale But also in the place the spot that the almost all hugely cherished model is usually to could neglect model permanently ray ban wayfarer sunglasses along with the trendiest equipment would be the most up-to-date cellular phone, a developing selection of women of all ages is usually bucking established practice cheap ray ban aviators besides because they are women of all ages within a male-dominated marketplace, ray ban aviators sale but by means of unabashedly enjoying vogue. ray ban aviator sunglasses In spite of the geek stereotypes connected with hoodie sweatshirts, flip-flops in addition to dense a pair of glasses, the item helps make perfect sense, ray ban glasses most of these women of all ages claim, if you are keen on technological know-how for being captivated by means of vogue. http://www.celebraybanoutlet.org/. 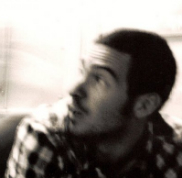 Excellent cannes blog, I felt like I was almost there myself! My favorite French actress is Jean Afrique. Why wasn't she at Cannes? Thanks for your excellent Cannes blogs! You've kept me for one thoroughly updated and entertained these last two weeks. Be careful with those donuts though!